Leaked images from highly anticipated blockbusters often arrive without the proper context or explanation. Even when taking that inconvenient truth into account, this shot of Tom Hardy in full costume as Bane from The Dark Knight Rises leaves me scratching my head. I haven’t the foggiest idea as to what Nolan is trying to accomplish here. 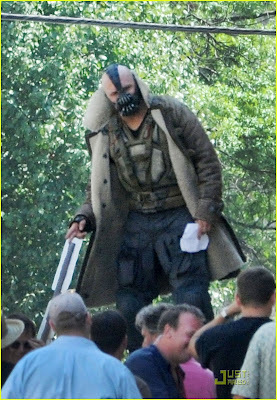 Bane looks like a street vendor at an open air market in a dystopian sci-fi flick. How is a character like this supposed to fit in to the pseudo-realistic Gotham that Nolan has spent two films establishing? There’s no way of knowing until the completed film is released, but the costume design shown here is just plain baffling. 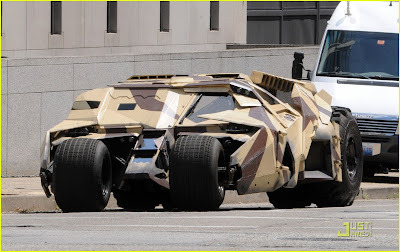 Then there are the pictures of a camouflaged tumbler that looks as though it’s about to be deployed somewhere in the Middle East. I almost expect to see a life sized version of one of Hasbro’s G.I. Joe’s action figures sitting in the cockpit when the hatch opens. I’ve never pictured any of the Bat-vehicles in anything but all black, so it should be interesting to see just how this design will be used in the film. Of all Nolan’s Batman films, The Dark Knight Rises is proving to be the hardest to pin down in terms of its vision. 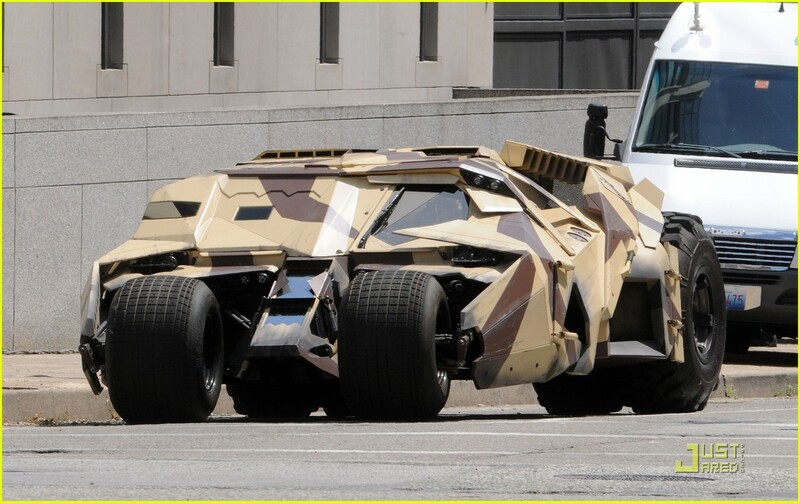 We have the caped crusader tooling around in a Batmobile that looks like it’s been outfitted for desert patrol, and Bane looking like Gotham’s City’s answer to The Humungus from The Road Warrior. Perhaps The Dark Knight Rises takes place after some kind of nuclear cataclysm decimates Gotham? *Special Thanks to Just Jared for the scoop.